We like the idea, but the execution could have been better. It's never fun when a nice car is involved in a rear end collision, but there are some advantages to being hit in the rear instead of the front. For example, the most important component of the car (the engine) is usually located up front. Therefore, being rear ended does leave a greater opportunity to repair the vehicle. That is exactly the case with this 2015 Hyundai Genesis that was involved in a major accident after just 1,365 miles. Rather than just have the car repaired back to its original spec, the owner decided to be a bit more imaginative. We often dream about the revival of small pickup trucks like the Subaru Brat and the Volkswagen Rabbit Pickup. As much as we want one of these cars to be built by a major manufacturer, there probably isn't a very large market. The owner of this Genesis obviously shares our love for what Australians call the "ute," because they decided to turn the damaged car into a pickup. 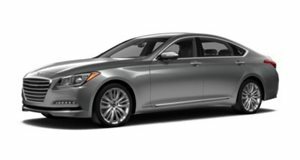 The owner says that they have "been a fan of the V8 Hyundai Genesis since they came out in 2009 and have purchased five new ones over the years" culminating in a new G80, but he always wanted to do a sedan to pickup conversion. When this 2015 Genesis was damaged in the rear, it was the perfect opportunity to do the swap. To make the pickup, the top of the car was cut off and the rear window was made from galvanized steel. The owner intended to make it a show car, but "ran into issues with paint." They contracted a body guy to help with the project, but the results were "disappointing." The car was also broken into and vandalized, which is why the owner just decided to make the rear end out of diamond plate aluminum. The result looks pretty ghastly, and the car doesn't even have a tailgate, so it probably won't be great at hauling stuff. This is clearly a project that someone needs to do correctly. The owner is 77 years old and is looking to sell the car on Craigslist in Arizona for $16,500. The owner says that they have no idea what the car is worth (but has more than the asking price into the build), so someone may be able to get it for a good deal. The car carries an Arizona salvage title and needs to pass inspection in order to be registered. There are a few electrical issues with the car including a persistent check engine light, and nonfunctioning audio and parking brake. One benefit is that the car has less than 1,500 miles on it and is the 420 hp V8 model. The chrome wheels came from a Kia K900 and the tires are Continental Pro Contacts with less than 500 miles on them. It may not be elegant now, but someone could come along and make this the coolest Genesis on the road.